Sometimes cliches can be unnervingly accurate. Photographer Laura Hospes' disarming and brutally honest self-portraits tell us things about mental illness that can never be captured through words. These beautiful and haunting images also tell us something about the strange and secluded world of the psychiatric inpatient unit - where people's emotional wounds appear distressingly overt. These are places where screaming, crying and emotional collapse happen as if on cue, and conversations are peppered with acronyms like ABI, BPD, CAT, ECU, MSE and DSM. Nowadays treatment in facilities like these (especially in public mental health here in Australia) consists largely of management and containment, keeping people safe with drugs or restraints. For some, perhaps, it might serve as a retreat - a place to stay when the world becomes overwhelming, but for many an inpatient stay can exacerbate the wounds they brought with them. Other people's pain can trigger our own. Whilst still a student, Laura Hospes documented her stay in a psychiatric hospital where she was admitted following a suicide attempt. To survive and make sense of what was happening, she took photos. She found a way of reckoning with herself and her emotions through the lens of her camera. Working in an inpatient unit has taught me that the people who come in often don't have a voice. They are either not listened to, ignored, dismissed, or lack the courage or the means to talk about how they feel. That is why pictures are so important. Laura Hospes (1994) has been capturing her own self with the camera since the tender age of 16, out of a need to connect with people. This need has not waned over the years; it has only become more necessary. Hospes' self portraits are her way of making clear what is inside of her. Her camera consoles and understands her better than anyone else. Photography is her medium to accept and process the many struggles in her life. The resulting images are intense and arresting, as well as being a captivating glimpse inside the world of a young woman dealing with depression and anxiety. Hospes was named one of the 50 best emerging photographers of 2015 by the international jury for the Lensculture Emerging Talent Awards. Her work has been frequently featured both home and abroad." It can be hard for people who don't live with mental illness to understand the terrifying nuances that come with the disorders. That's exactly why 21-year-old Dutch photographer Laura Hospes published a series of stunning self-portraits that expose what mental illness can really be like. The project, named "UCP-UMCG" after the psychiatric hospital where the photos are set, shows Hospes as she receives treatment for anxiety, depression and disordered eating. 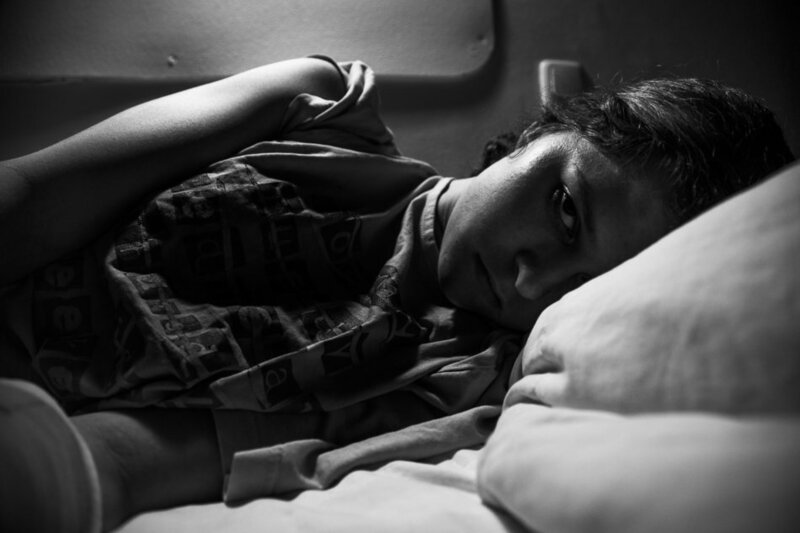 The images beautifully expose her daily life in the hospital -- and the strength it took to seek treatment. "Having a mental illness is the hardest thing I experienced in my life," Hospes told The Huffington Post. "People can't see that you’re ill, they just see a normal person that can still laugh sometimes and having a nice evening. What they don't see is the miserable hours after any social event and the breakdown I had every morning when I had to leave my bed. ... And that's just a small part of all the difficulties." Hospes began taking the photos her first day in the hospital, adjusting her methods of photography based on what the center would allow. Her goal for the project -- in addition to documenting her own journey -- is to prove to others that you can be the textbook definition of "normal" and still need to overcome difficulties. People can't see that you’re ill, they just see a normal person that can still laugh sometimes and having a nice evening. "I hope people are aware of the fact that people who are in a psychiatric hospital are not crazy. They have a very difficult period in their life and need time to recover so they can be themselves again," she said. The photos were a cathartic way for Hospes to be in-touch with her feelings as she moved forward in the treatment process. She wants the images to serve as a powerful reminder for others whose loved ones suffer from similar mental health conditions. "Stay with them in your mind and let them know you are thinking about them," she explained. "That is the most thankful thing for a person who feels to be slowly 'going crazy' and having no control of it."